This post originally started out as a product review, but as I got carried away (which I'm sure you all know I often do while blogging!) with the science behind both the storage and production of energy as well as the process of fat burning, that it kinda metamorphosed into one super-long post! So I thought I'd split it out into two posts, the product review and the science part. When you eat a meal containing carbohydrates, they are broken down to form glucose , which is often referred to as "blood sugar". As glucose is a monosaccharide, or "simple sugar" as it's commonly known, it passes straight through the wall of the small intestine and into the bloodstream. 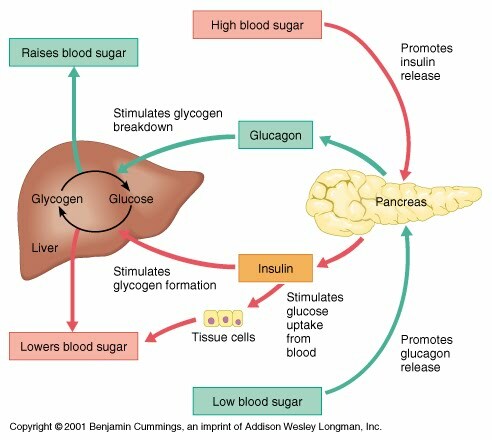 It is here that the hormone insulin, which is released by the pancreas when it detects an increase of glucose in the blood (i.e. 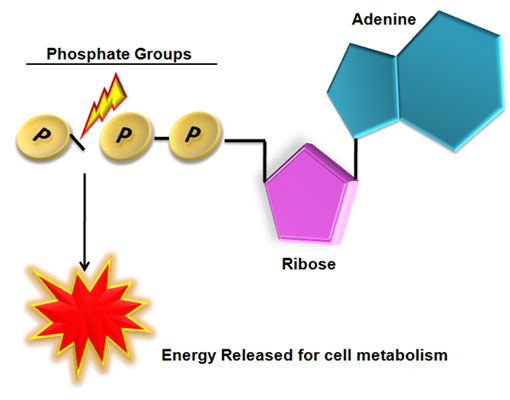 after a carbohydrate-rich meal), facilitates the transport of glucose to the liver and muscles where it undergoes a storage process called glycogenesis, during which time the glucose is converted into glycogen (see pics below - click for larger image) and stored in the liver (for blood sugar regulation) and skeletal muscles (for energy). In the event of a surplus of glucose in the blood (i.e. the glycogen stores in your muscles and liver are full to capacity, and glucose is not immediately required for energy), instead of ferrying the glucose to your liver and muscle cells, insulin encourages the body to convert glucose to fat and store it adipocytes (fat cells) as adipose tissue (AKA "body fat"). This feature has earned insulin the nickname "the fat storage hormone", which is unfortunate as storing fat is not its sole purpose! This ability to store surplus food as fat is a fabulous feature of the human body. Fat is a relatively metabolically inactive tissue that exists in a mainly anhydrous (water-free) environment. This makes it light and requiring very little effort or energy from the body to maintain it - this is in stark contrast to our muscles which are a lot more dense and store as much as 3g of water for every 1g of glycogen! Also, one gram of fat provides the body with 9 Kcals (Calories) of energy (which is more than double the energy provided by a gram of carbohydrate), and this equates to a whopping 3500 Calories of energy available to us for every pound of fat present on our body. Human beings would not have been able to survive as a race if we didn't have this storage feature available to us. When food is plentiful we store it easily as fat and carry it around with us - literally on our person - far more effective than storing it in a fridge! When our bodies detect that we are consuming less Calories than needed to run efficiently, we are then able able to tap into our 'mobile larder' and utilise some of our fat stores. 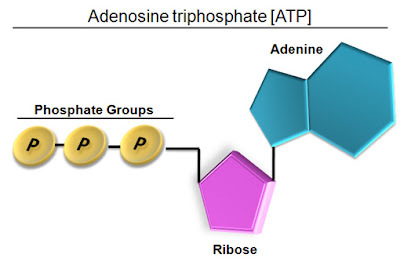 When we exercise, the opposite to the storage process (glycogenesis) that I mentioned above occurs and a process called glycolysis takes place during which adenosine triphosphate (ATP), is produced. During the first 20-30 minutes of aerobic activity, the body will primarily be using up its stored glycogen supplies to provide energy for your workout. After that it will look to other sources for glucose and it's at this time that it will recruit your fat stores. That is, unless you were to recently have drunk - or be drinking - a sugary/glucose-rich energy drink as your body will immediately take advantage of the instantly accessible glucose in your bloodstream and turn to that to provide the energy for your workout, and who could blame it? In order for us to lose bodyfat we need to persuade our bodies to use it as an energy source i.e. as its fuel. Normal metabolic processes like cell reproduction, brain functionality, breathing, pumping blood throughout the body etc all require fuel, and so it follows that if we consume fewer calories than we use during these processes we create a deficit which leads to - yup, you guessed it - fat loss! Examining ones diet should really be the first port of call for anyone wishing to lose weight - after all, comparatively, the time you spend exercising during the day vs the time you are not is pretty minute. Because of this, it's really Calories you burn when you're *not* active that matter more than the ones you burn when you are - hence the need for an overall Calorie deficit as mentioned above. In the same way that insulin is referred to as the "fat storage hormone", cortisol, one of our key "fight or flight" hormones, is also demonised by the diet industry. Cortisol is a very useful and necessary hormone so long as the perceived 'threat' that led to its secretion is alleviated as soon as possible. Scientific studies have linked chronic stress to a number of health issues including high blood pressure, digestive complaints, inflammation, skin problems, impaired reproductive functionality, increased heart rate, increased abdominal fat... the list goes on! Also, due to its catabolic nature, cortisol also encourages your body to break down body tissue (including precious hard-earned muscle which we *really* don't want!) and reduces bone formation! As if all that wasn't bad enough, cortisol also increases your appetite too, which is another undesirable side-effect that can make resisting temptation during dieting even more difficult! 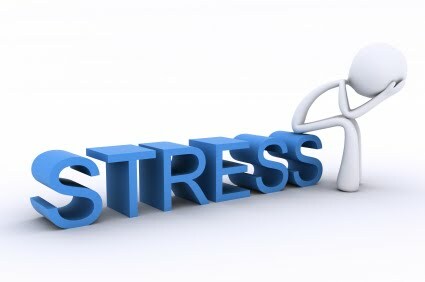 All in all, you really want to keep your stress levels as low as possible. In today's busy working world that may be incredibly difficult. However there are things we can do to help reduce our levels like taking time out even if it's just for 20-30 minutes, ensuring we get a good night's sleep, watching a funny movie or participating in some sort of physical exercise. Your body cannot store alcohol so it uses it for fuel, and continues to do so until it it has all been removed from your bloodstream. 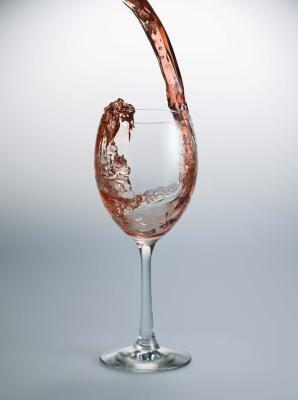 While your body is doing this it is not recruiting any other fuel sources which means that if you're eating a big meal and enjoying several large glasses of wine with it, you may well find that more of it gets stored as fat than would have done had you not been drinking. It's also worth noting that as alcohol is such a great disinhibitor you often find that the more drunk you get, the less likely you are to make healthy decision when it comes to food! 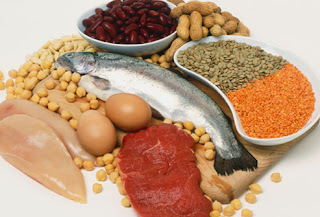 If you consume a decent amount of protein in your meals you'll use more energy processing it than you would carbohydrates or fat so your net calorie intake is reduced. This also means that your body takes longer to process your meal, which results in your feeling fuller for longer. Gaining extra muscle also helps to strengthen bones as the more you have, the more force you exert on your bones (onto which your muscles attach) causing them to grow stronger to cope with the added strain. Running is also hugely beneficial for increasing bone density because of the high impact it produces. So after taking all the above into consideration, how do we encourage our bodies to burn fat as a fuel during exercise? Well, in order to 'tap into' your body's fat stores you need to first have used up your body's supply of the more easily attainable glycogen. 1) Aerobic/cardiovascular "cardio" activity performed on an empty stomach (e.g. first thing in the morning before breakfast). Commonly known as "Fasted Cardio" this is very popular amongst those wishing to utilise their fat stores for fuel while exercising because of the absence of glucose in the blood. The theory is that once the body has burnt through its supply of intramuscular glycogen it will turn to its fat stores. It is important to take on board carbohydrates and proteins as soon as possible after this exercise though to avoid low energy levels throughout the morning. The efficacy of Fasted Cardio provokes many differences of opinions, especially among bodybuilders! Here's an interesting article from the fabulous T-Nation site. 2) Performing cardio after a weight-training session. During a 'traditional'/'classic' weights session, e.g. lifting heavy weights for short periods of time, you will primarily have been exercising anaerobically (during which time the body will *only* be burning glycogen or glucose as neither fats nor proteins can be processed in the absence of oxygen). If you follow up a 30-45 minute weights session with some low-intensity cardio you can pretty much guarantee that you'll be tapping into your fat stores for fuel. Whether or not this method is indeed useful in assisting with fat oxidation, it is generally the approach I take when incorporating both strength and cardiovascular training into one workout, as I find that aerobic exercise tires my muscles out such that I wouldn't have as effective a weights session were I to tack it onto the back of a cardio one. The subject of fat burning during exercise and its various methods (HIIT Vs SSC, fasted cardio Vs fueled etc...) does seem a contentious one with many people having differing opinions as to what's effective and what's not. As everyone's bodies behave in different ways I think it important for you to try a variety of methods and settle on what you feel provides the best results while keeping you healthy and energised. b) in the case of complete liver glycogen and glucose depletion your body will enter a state of hypoglycemia which brings with it unpleasant (and potentially life-threatening!) side-effects. This is definitely *not* what you want to encounter 90 minutes into a training run or cycle, the latter being the most dangerous given how far 90 minutes of cycling can take you before you 'bonk' or 'hit the wall'. It is worth noting, however, that the the better condition you are in, athletically (i.e. the more 'trained' you are), the greater the volume of glycogen your muscles can store, which is one of the reasons why elite runners and cyclists can go further without 'hitting the wall' than ordinary athletes. Add to this the fact that the fitter you are aerobically the more adept your body becomes at utilising fat for fuel and this fully illustrates why all endurance athletes (and not just people who train for strength and/or aesthetics) should incorporate strength training into their workouts and make muscle hypertrophy - as well as cardiovascular fitness training - a priority! I myself am prone to hypoglycaemic (low blood sugar) episodes which manifest in the form of nausea, shaking, dizziness, feeling uncomfortably hot and going deathly pale. In these instances the only thing for it is a can of full-fat coca cola - eughh! Does the trick though. I'd like to add that I haven't had one of these episodes in ages since I started ensuring that I eat breakfast every morning without fail, which leads me onto another point I'd like to make about carbohydrate. The anabolic regeneration of your body that takes place during sleep requires a great deal of fuel to facilitate it. This is what results in the depletion of your glycogen stocks, so to even consider starting your working day without taking any carbohydrate on board is probably not the best choice to make. Glucose is food for our brain, and because it cannot store it in the same way that the muscles and liver can, it relies on there being a steady stream of it in the blood. So don't starve your brain! In fact, I found researching the individual topics so enjoyable that yesterday I spoke to my other half about possibly completing a course in Human Nutrition and he's in agreement that I should go for it! So I'm actually going to add another string to my bow and complement my Level 2 Gym Instructor qualification (and forthcoming First Aid certification) by completing a Certificate in Nutrition and Weight Management. I haven't decided who with just yet as the same qualification seems to vary considerably in price across the different fitness qualification providers and there also seem to be a few different award bodies too... it's all a little confusing! You see, I've harboured a dream to become a dietician/nutritional advisor for almost 15 years! When my son was born he was almost 7 weeks early and quite jaundiced. Because of this I ended up spending about 2 weeks in King's College Hospital, London while he recovered enough to be sent home and while I was in hospital I was assigned a dietician who was just wonderful. I ballooned in weight to over 200lbs when I was pregnant and after I gave birth I was constantly ravenous and didn't find the hospital meals nearly substantial enough. I was clearly very overweight but she didn't judge me at all, just just made sure I had enough to eat to keep me happy and even brought up extra wholemeal bread sandwiches. She was a doll and I dearly wish I remembered her name. This lovely dietician had such a profound effect on me, that to this day I still feel indebted to her kindness and wish I could tell her how grateful I was and indeed still am. I still have this dream to become a registered dietician myself. However, to become fully recognised by the British Dietetic Association, I'd need to complete a degree course in Human Nutrition & Dietetics and that would require me to a) complete a science course first as I have no A-Levels and b) leave my job as I can't seem to find any that are part time! (b) is not possible as we have an expensive mortgage!! That being said, the university from the first link (London Metropolitan University) does another nutrition degree course (Human Nutrition BSc) which doesn't require you to study full time but doesn't have the dietetic element. This course is accredited by The Nutrition Society and successful completion results in admission to the Register of Associate Public Health Nutritionists. This article from the government's 'Next Step' website is very helpful and informative. The role of a nutritionist sounds a very interesting one indeed, especially with the option to participate in scientific studies. All food for thought as they say and if I'm honest I'm very excited about the future. Although fitness training is - and always will be - hugely important to me, it's the science of food that really floats my boat. I know that I want to specialise in nutrition, it's where my heart and real interest lies, and one day I know I'll get there, I just have to explore the various avenues I might need to pursue in order to reach my goal. Okay, I really will stop writing now, I think this is the longest post I've ever made - eek! This is a great post! So much useful information, very nice! Great post Tara, and it really helps to read an opinion that is balanced, not just one-sided. I'm finding I'm having to read into nitrition much more now as well as I'm training for my first ever endurance event - Ironman UK - and it is quite hard to find a balance between losing bodyfat and weight (need to lose about 5kg), yet not overload on carbs just because of the long rides and runs I have to do. And combined with that, I am still trying to work out how to add weights to this training. I don't use a gym now, but have been thinking of resistance bands - have you ever used them? Nice post with lots of insights. Keep writing!